About the project (text supplied): The Courtyard House encompasses both a new build and a conversion to the modest St Saviour’s Church in inner-city Collingwood. With its dense composite of residential conversions and developments within mixed-use industria, this context provided an architectural opportunity to rethink the family home while incorporating a former place of worship. High perimeter walls create an immediate sense of enclosure and proportionate scale to the church and nearby buildings. Where a curved plane of concrete in this facade peels away along the street front, a concealed entry opens into a vast outdoor courtyard, dominated by a 17-metre lap pool and concrete canopy above. The church rises to the right, while at ground level it is sensitively connected to the new construct via a glass link. This is a pivotal point; more than a physical connection, it is a symbolic link between old and new, a subtle transition into the former place of worship. Orientated to this courtyard, the home’s living areas on both levels are flooded with northern light, which generates a play of light and shade within and blurs the boundaries between inside and out. The upper level is set back and overlooks the courtyard and a roof garden. The clarity of detail and pared back finishes throughout create a clean Modernist aesthetic that elicits a sense of calm, in contrast to the bustle of the urban surrounds. 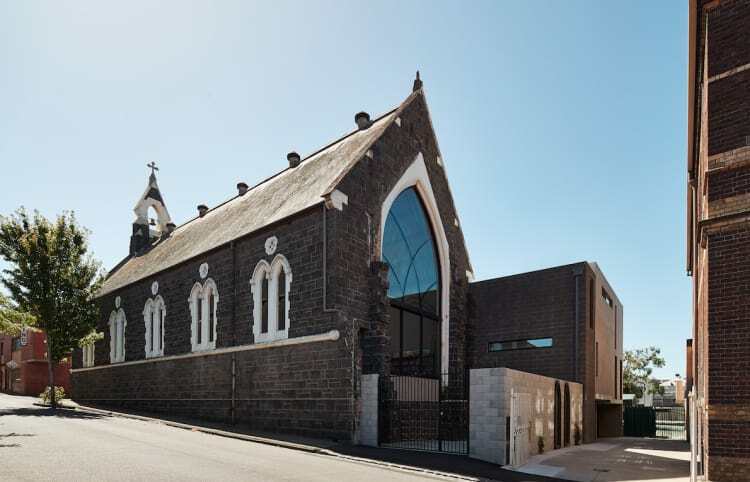 An extensive use of concrete in this new addition both complements and contrasts the existing church fabric, while original windows and bluestone footings have been reintegrated into the new building and landscape in considered ways.